To mark the centennial of the battle of the Somme IMFC was recently honoured by Vernon Military Tattoo event organisers with a prime location for the Duty, Honour Izzat display. 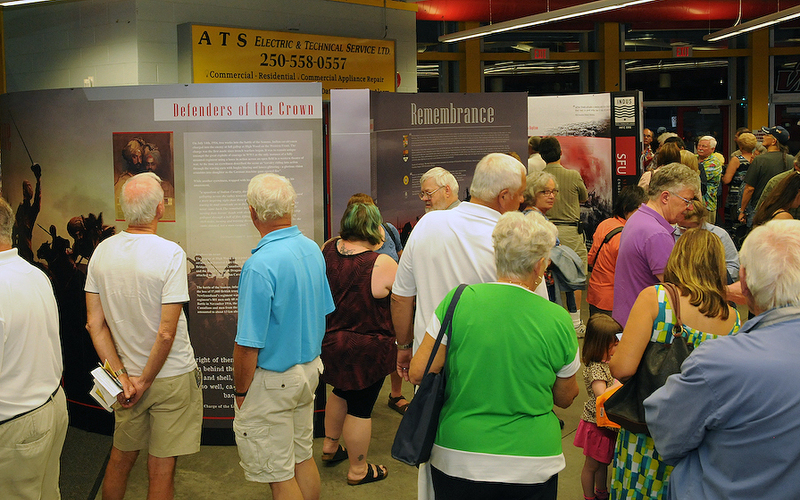 Installed in the foyer of the Kal Tire Stadium, all attendees at the 2-day event that took place on July 23rd & 24th in downtown Vernon ( now second in size only to the Tattoo in Halifax), were able to take in our updated exhibit. 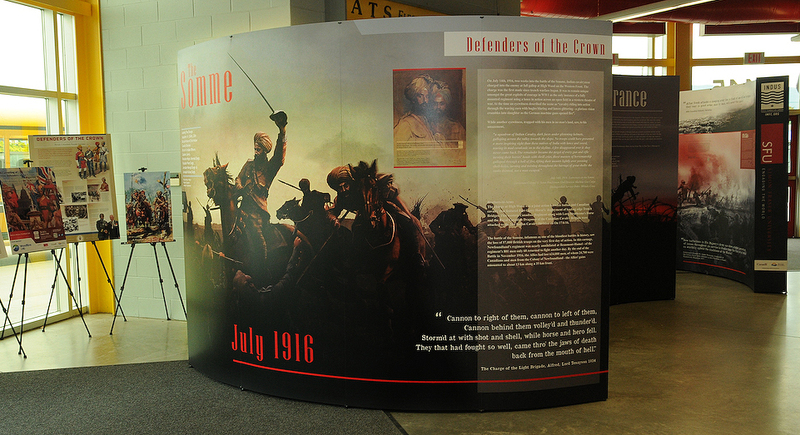 This year we unveiled a new addition to the walls to commemorate the July 1916 start of the landmark battle. After receiving a warm reception last year, we were returning to Vernon for a second showing. In 2015 we highlighted the story of Punjabi and Canadian brothers-in-arms fighting under one flag in Flanders Fields https://www.youtube.com/watch?v=w14ZJUhlUIA&feature=youtu.be . 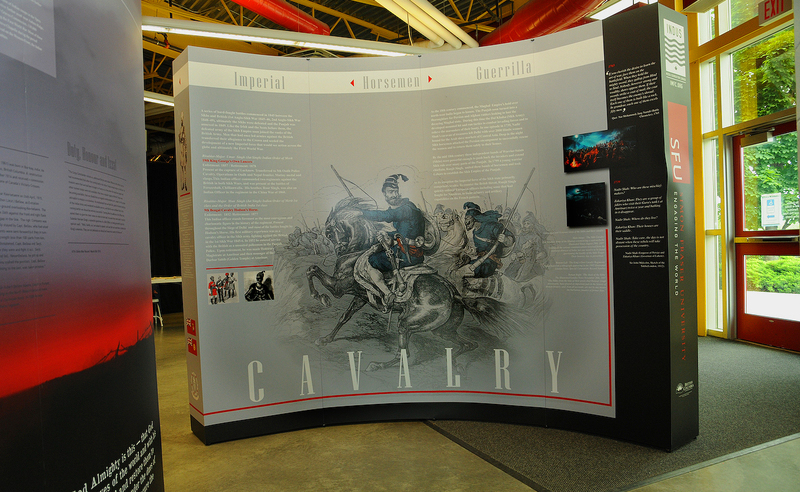 This year we opened the chapter on the battle of the Somme during which an Indian cavalry regiment ( 20th Deccan Horse) led by a Sikh Squadron made a spectacular charge at High Wood (July 14th, 1916) with the help of Canadian Forces ( Fort Garry Horse). This was the only cavalry action on the Western Front in the First World War to employ lances at full gallop in a charge across open ground. This singular honour of undertaking one of the great exploits of courage in WW1 belongs to the Punjabi community and is an event we are proud to share with all Canadians. The Somme was one of the bloodiest battles in history; Canada suffered 25,000 casualties amongst which a regiment of Newfoundlanders was nearly annihilated at Beaumont- Hamel – of the regiment’s 801 men only 68 returned to fight another day. Vernon is home to a large Department of Defence facility and has a military history stretching back to 1912 when the first cadet training centre in Canada was established; about 1200 cadets continue to train here every summer. Many retired military personnel settled in the Okanagan attend the Tattoo event. This piqued our interest on our last visit because quite a few of them belong to long-standing military families – and they were thrilled to share with us the stories of maternal & paternal grandparents being born in India and serving in the Indian Army. Thus we were excited to return to Vernon, sure amongst the thousands that would stream past our displays, many would take the time peruse the exhibit and speak to us about their feelings on re-discovering a shared chapter in history that has until now been lost to most. We recall a conversation from 2015 that struck a deep chord with us: an elderly lady probably in her 80’s stood amongst three generations of her family mesmerised by the picture of King George V in a turban (he is portrayed as the colonel-in-chief of a Punjabi Cavalry Regiment on the main display wall). On turning to her family, she mentioned she had seen the picture before. I overheard the comment and could not help but notice that she had teared up. I went over to ask her when & where she saw that image and why it had moved her to tears? She confirmed that it was at school in England – pre -1947. Then she turned to her family and said it reminded her of a time once when she was a child, when her grandfather had sat her on his knee and told her a story about his gallant Sikh soldiers. It was something new about herself she was happy to share with the youngest of her grandchildren there with her. A memory not recounted for 70 years is a precious in-memory link to a distant past – a fleeting exchange diminishing with each passing year. That’s why we were very excited to learn about a legacy of our previous visit to Vernon that literally memorialised the story of brothers-in-arms coming together for the common good – in stone. A conversation last year with local artist, and president of BC Arts Council, Amanda Shatzko had prompted her to make a public art sculpture she had designed more inclusive. Honour bound by the story of the Sikhs’ stand with the CEF in Flanders Fields she added another poppy featuring a turbanned soldier. 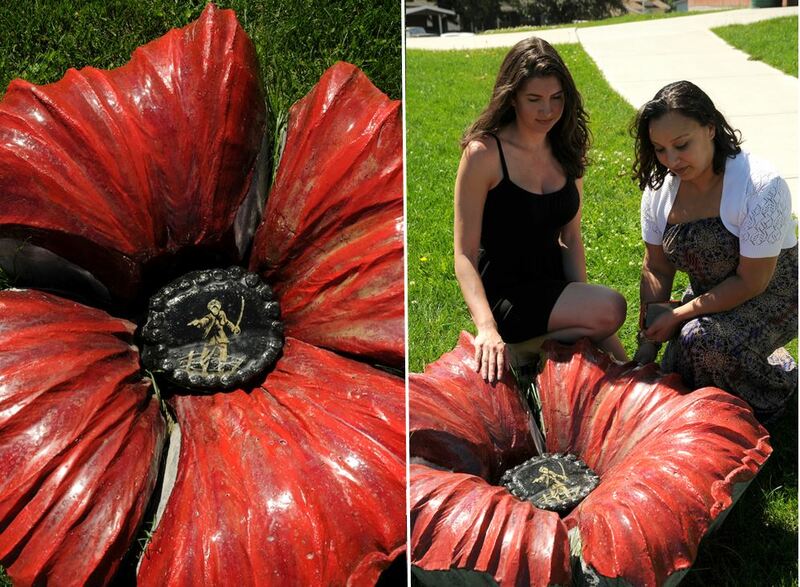 Funded by a grant of $48,150 from Heritage Canada and the World War Commemorations Community Fund a set of 5 concrete poppies, each about 4 foot in diameter, 1.5 feet tall and weighing in at about 750 pounds were installed on the grounds of Vernon Secondary School. According to her, she had a simple goal for the sculptures; “Showing support to the veterans and everybody in World War I and World War II and even beyond that to the veterans up to nowadays in all the other wars who have fought for freedom for Canada.” She added the rendering of the images on the poppies further honours the war veterans “They are actually made out of phosphorous and paint so the images will technically glow in the dark. It was done that way to represent the eternal flame of the spirits and souls of people who have sacrificed for our freedoms.” While it is true that the visible minority population is relatively small in Vernon, the local Sikh community can boast both a mayor ( Akbal Mund) and a city councillor (Dalvir Nahal). And thanks to Amanda they now have something else other BC communities with much larger South Asian populations don’t have – a memorial to their heroes. You could say Vernon has truly embraced diversity with both arms, and we would like to think our project had a little part to play in it. Beyond history books to be read in private or even historical movies to be watched with friends, public exhibitions and memorials hold a different promise in connecting with people with any number of permutations of disparate experiences, memories or even awareness – they can stir unique dialogues between strangers. Again, in this regard, Vernon would not fail to inspire us on this visit. An exchange that lingers deep was a short but profound conversation with an ‘old-stock’ Canadian a man probably in his early fifties. He stood silent, alone, brooding in front of specific quote from a regimental war diary. His demeanour clearly shaken compelled me to approach him. The content laid out in front of him was an extract from the War Diary of the 47th Sikhs Regiment for the eve of the March 10th commencement of the first Allied offensive action on the Western Front . The battle of Neuve Chapelle was a pre-emptive strike against the enemy in which the Indian Corps would comprise more than 50% of the attacking force; the Canadians had only just arrived on the frontlines. Peering over the gentlemen’s shoulder I introduced myself as the curator of the exhibit and enquired as to whether he was able to relate to the quote’s notion of duty? “Have you served?” I asked. ” Sorry,” he replied. ” I find it difficult to speak right now – I seem to have a lump in my throat.” I left him for a moment to return after speaking to another group. ” I am an ex-serviceman, but that’s not it.” Then, looking me in the eye, he released the words he had been holding back “I just wish I could drag all my red neck friends here today to see this.” I actually can’t remember my exact next words, but it must have been something along the lines of thank you for taking the time to look around the exhibit. At this midway point of the Centennial of the First World War, we continue to hope to bring people together in the true spirit of remembrance and help bridge what is often a huge divide between disparate communities. We have lost so much to these murky crevices, stirring stories of sacrifice and brotherhood are 100 years later shrouded by a myopia of cognitive dissonance. It couldn’t really be true? It couldn’t have happened that way? We were never told about this in school, nor did we see it in the movies. The Sikhs couldn’t have held the line at Flanders Fields or charged at full gallop into the deadly mechanised jaws of modern warfare in an act of unyielding duty during the battle of the Somme? We are here to tell you that it’s true that it happened that way – that it wasn’t all white on the Western Front and that brave men came together from across an Empire in a united cause – fighting far from their homes for rights and freedoms they aspired to themselves, that neither were they war mongers or slave soldiers, that in fact, honour was their creed. Picture 1: Amanda Shatzko and Vernon City Councillor Dalvir Nahal onsite at the Vernon Secondary School public sculpture.